The other day I was on the phone with my son. He is considering taking his children (girl, age 11 and son, age 10) away for a few days. We were discussing suitable places for a winter time visit. He lives hear Philadelphia so I suggested Washington, D.C. He's been there before with the kids and they love it. During the winter it should be a lot less crowded. We also talked about places like Gettysburg. (My husband reads anything he can grab his hands on about the battle.) My son, though, felt the children are still too young to appreciate what went on there. So we discussed other possible trips like at a resort that has everything inside. That brought up topics like indoor water parks in Virginia. Both of my grandchildren are water nuts and Virginia is far enough away to make it seem like a real vacation and yet close enough to do it for a long weekend. He still has to decide where to go but living in the Philadelphia area gives him lots of options. I just played around with the email links. You have to click on the blog title within the actual email post. So if you didn't see the videos, go to the Polar Bear email you received and click on the blog title at the bottom of the email. I also subscribe to my blog, just to confirm information is sent correctly. 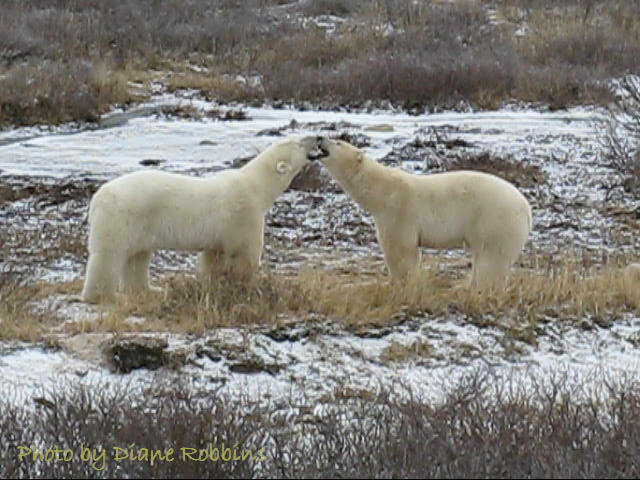 I want to confirm that everyone who subscribes also received the polar bear videos. There are two videos embedded in that post. 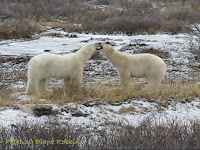 What I assume all of my regular readers have been waiting for .... the polar bear pictures and videos! I think one reason this took so long in coming is that it definitely was the hardest post of the trip to write. Actually, the hard part is selecting the pictures. 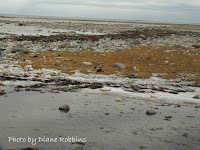 We were out on the tundra for three full days and probably saw between 15 to 20 bears each day. That's a lot of bears and a lot of bear behavior and a lot of pictures and video. Hope you enjoy the selections I've made and find the reason why I chose them interesting. 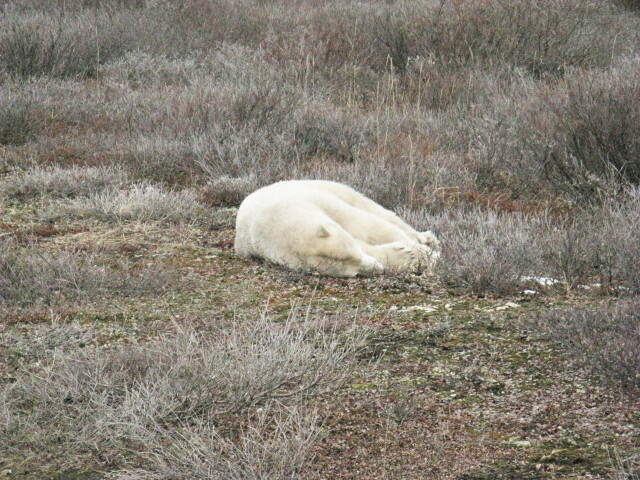 So, obviously we saw a lot of bears just lying around doing nothing. Other times we saw them interacting with each other. The area around Churchill is the only place polar bears show social behavior. 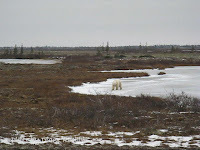 In other parts of the world the bears are solitary as they complete for food. 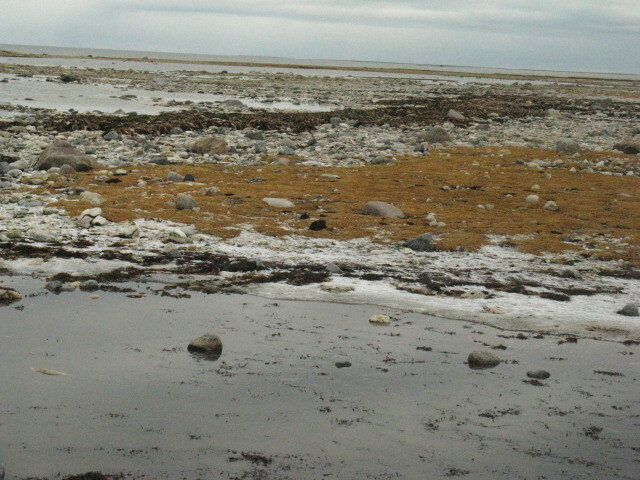 Here the bears are all waiting for Hudson Bay to freeze and, once that happens, they will resume the typical solitary behavior. Most of the time they ignored us but every now and then their curiosity got the better of them and they came over to the rovers and looked up at us or got real close, went up on their hind paws with their front paws on the rover, and gave us a thorough look-at through the window. We saw a lot of playful sparring ... bears up on their hind legs pushing and shoving. 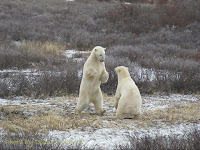 This behavior strengthens the bear and will help its survival because once it is on the ice the bear will rise on its hind legs and punch down on the ice with its powerful forequarters in order to break the ice and get at seals they see below it. I found it interesting that as big and strong as these bears are, with no natural predator, they can still be easily spooked. When we had the windows of the rover open, the only thing you would hear was the clicking of shutters. We all spoke in a whisper and no one out on the back deck made any quick movements. Notice in this video how this bear got startled and walked away. And look at the size of the paws! I couldn't get over how HUGE they are. And some of the time I just watched as the bears walked along the shore, sniffing the air, and pretty much just minding their own business. I recently wrote about how to save money on hotel costs by using some of the discount sites online. Another way to save money, or to get more for your money, is by doing a vacation rental. I've always wanted to do a vacation rental. I think it would be really neat to stay in an apartment, with two of the big amenities apartments have to offer: a kitchen area and lots of space. As I was thinking about it, I realize we have already done just that. Our hotel accommodations in Reykjavik was a studio, a huge room with a sitting area, a dining area and a galley kitchen. It was great! Friends of ours just returned from renting a villa in Tuscany ... another item on my bucket list. And other friends rent a condo in Florida very February. Whether Tuscany, Reykjavik, London or Barcelona vacation rentals, or just heading to Florida, consider an apartment for your stay. 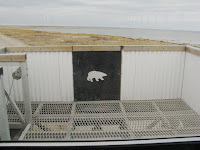 Yes, Churchill has a bear jail. 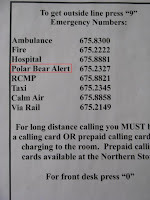 During polar bear season, there is a regular bear patrol. If a bear is reported as being too close to town, an attempt is made to scare the bear off by, essentially, firing a 'firecracker' in its direction. 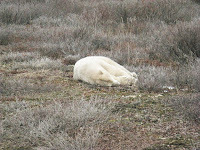 If that doesn't work, the bear is tranquilized and taken to the Polar Bear Holding Facility. We didn't get to see inside the facility but were told that the inside is kept dark, the bears are kept in cages close to each other (not something they normally like) and are only given water to drink ... essentially, making the place somewhere they don't want to return to. The bears are tagged and then flown far away from town and released. If the bear returns it gets a second chance. A third time, though, and they are out. 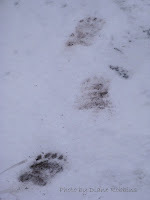 We were fortunate to see a bear lift on our last morning there. 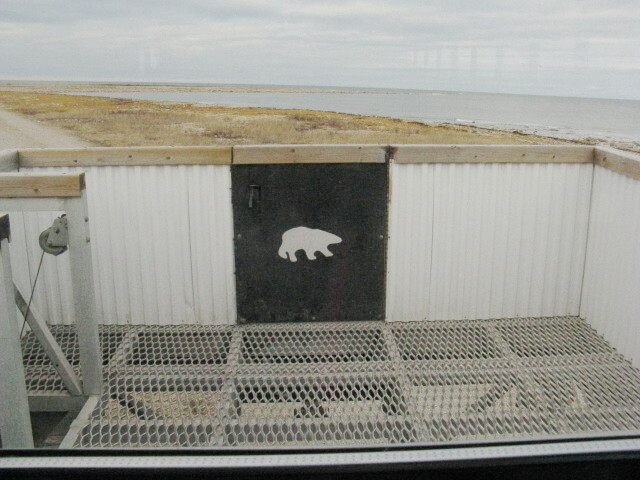 There are no roads to Churchill, Manitoba. Everything comes in by air, boat or rail and that includes both supplies and people. 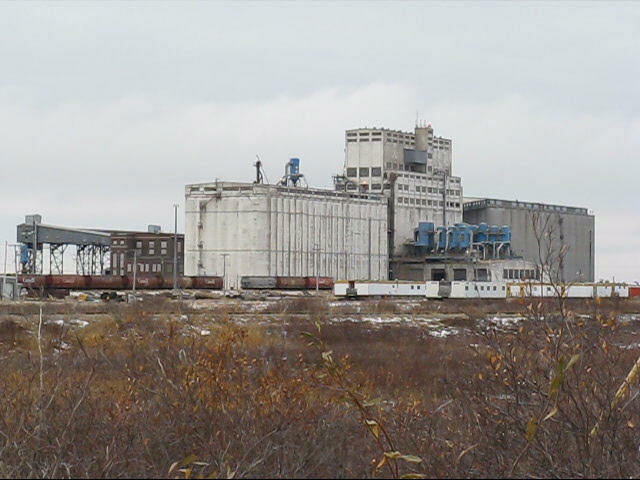 Most of the trains coming into Churchill (3 days per week) are hauling grain during the growing season. 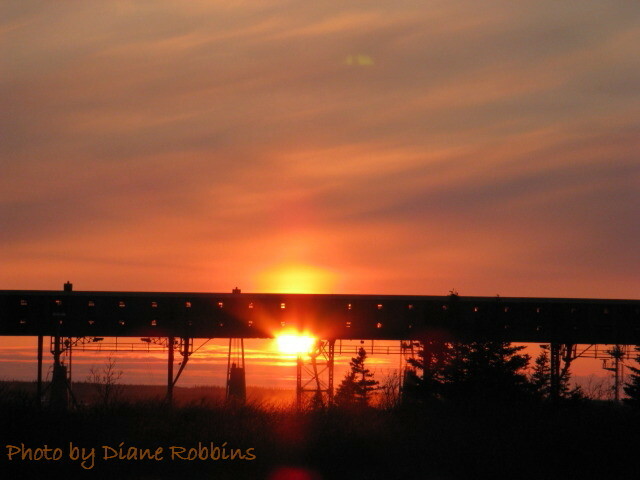 The grain is then loaded onto barges which head out to the Atlantic through Hudson Bay, delivering grain all over the world. 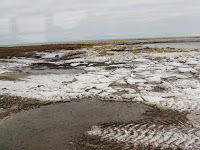 As we traveled around the tundra we saw tire tracks from the polar rovers. The tires are huge and cost $3,000 each. There is not doubt they cause damage so there are very specific areas where they can go and where they can't. The park service determines which tour companies have permits and for which areas, trying to keep some of the damage under control while still allowing the tourism that brings so much money into the area. As we traveled around the tundra, our expedition leader encourage us to look at the landscape, patterns on the ponds and rocks along the bay's shoreline. After all, we WERE on a photo trip. Sometimes there were pictures worth taking by looking backwards. 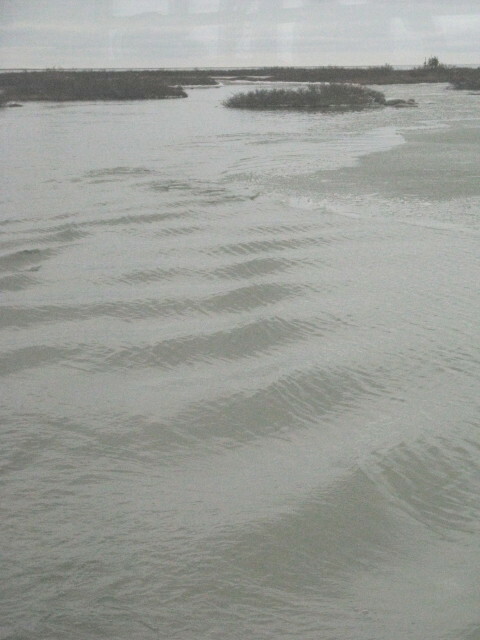 These are the ripples left by our rover as it went through the water. The recent post I did on sailing the Chilean fjords reminded me of some research I had done before our Antarctica trip, sailing the glaciers at the southern end of the continent. The majority of Antarctica sailings are round trip to Ushuaia and I had figured if we were going to travel that far, I wanted to see as much as I could. 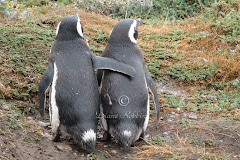 So I had considered a sailing between Ushuaia and Punta Arenas on the Via Australis. Taking a cruise to see the glaciers is a great way to visit Patagonia. 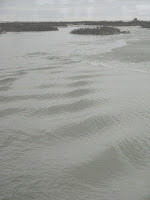 A friend of mine who did a land tour to Patagonia actually did this sailing, even though she is prone to seasickness. She had done her research and knew that the inside waters are extremely calm and the scenery and experience was going to be well worth any slight discomfort she might feel. As it turns out, she was totally right and thoroughly enjoyed the sailing. The ships that sail this route are small but are beautifully outfitted with lots of wood. There are lectures after dinner and gorgeous scenery to enjoy during the day, for a full travel experience. The Internet is absolutely the best place to do research for a hotel room. Whether you are researching a property by using sites like Tripadvisor or Frommer's, at some point you are going to want to book that hotel. I typically start right at the hotel's web site and check the availability and rate for the date and accommodations I am interested in. Sometimes I learn something that makes me want to book directly with the hotel, such as wanting a specific type of accommodation. Other times I'm just interested in a general area of a city (like when I went on a long weekend trip to Boston with our daughter) and any hotel meeting certain requirements, such as star rating and location, will suffice. In cases like that I check out a site like Hotels.com . Besides providing great rates, Hotels.com has a Welcome Rewards program that can earn you a free night. I did some checking at other booking sites and I didn't see anything like this. (Hope someone will let me know if I'm wrong.) For someone who travels frequently, this can be a great deal. Shopping in Churchill is expensive. Just for the experience we went into the supermarket and I checked prices of items I buy at home like a box of Cheerios. In general, prices were 50% to 100% higher than my local grocery. And there was nothing like the selection I have at home. It was kind of take it or leave it. We could see how items were shipped in on shrink-wrapped pallets and often just left like that rather than shelved. By far the best shopping, for us, was at the Eskimo Museum. They didn’t have a huge selection of items but what they did have was some of the best prices in town. Jerry likes to collect baseball caps and they had the perfect one for $16. We saw others for $25 and $30 that weren’t as nice. There was a good selection of t-shirts and jackets. We bought, of all things, safari shirts, perfect for our hot weather travels. We thought it would be real neat wearing safari shirts with polar bears and Churchill embroidered on them. Also at the museum was a very good selection of carvings and books. They had a small table of jewelry at excellent prices. 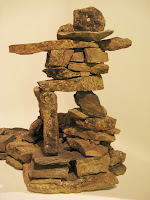 I bought Inukshuk earrings for myself and for my daughter. All together there are about 8 gift shops in town, some stand-alone and some within hotels. The Great White Bear Tour Company had very nice stuff at decent prices but the majority of their items had the company name on it, not the type of stuff we look for. Northern Images had fantastic high-end art. Jerry had the camera and lens for the polar bears. I got some good shots when they were close to the rover. But for me, this photo trip resulted in my learning more about my camera and concentrating on other-than-wildlife photo opportunities. 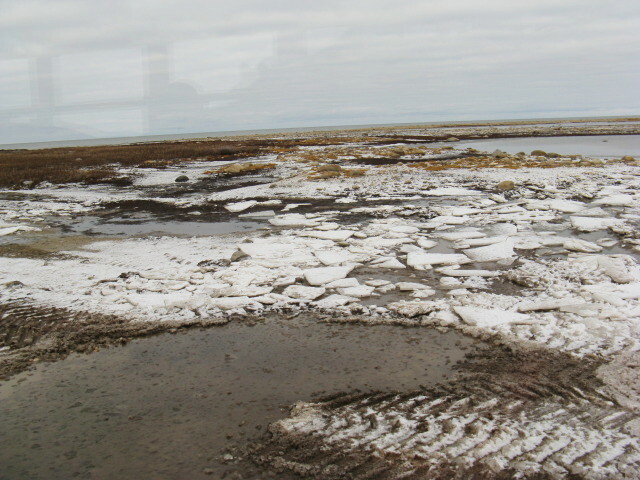 The landscape around Churchill is stark. There are very few trees and those that do live in that climate are called flag trees. 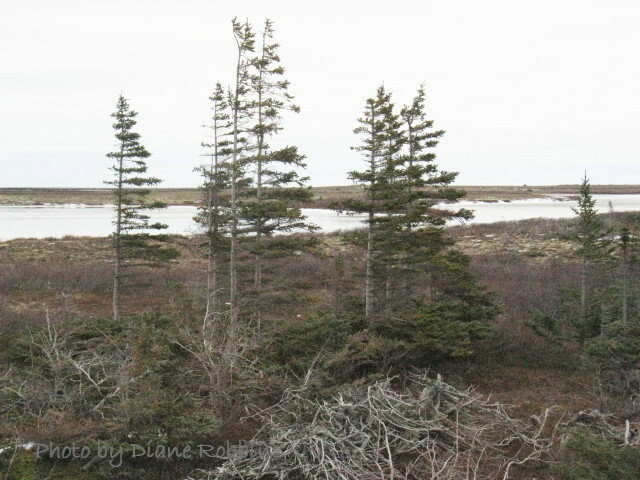 The part of the tree facing north is bare, sheared clean by the freezing north wind. 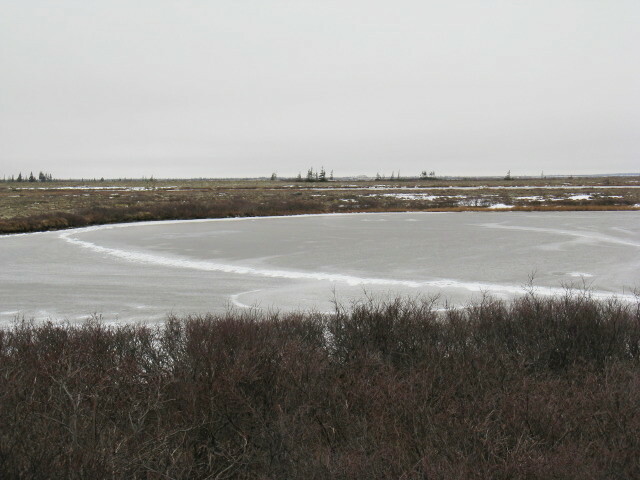 The area approaching Hudsons Bay is marshy and rocky. The low and high tide line is huge, with the water coming in at places 400 to 500 feet. 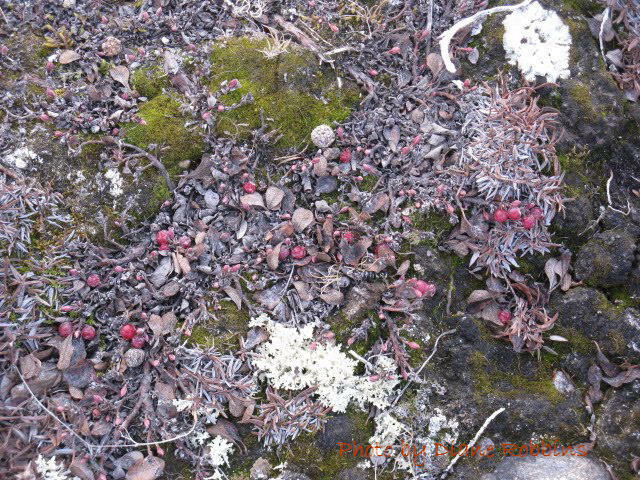 Rocks are covered with lichen and the ground is covered with moss and some small berries. 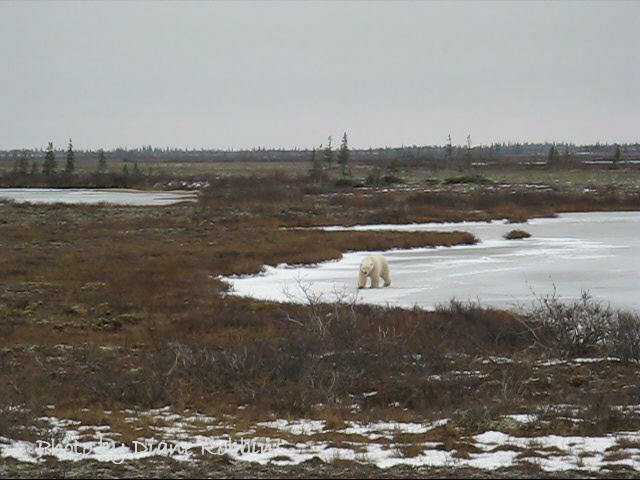 As winter approaches, the marshy areas freeze over with ice hard enough to support a full-grown polar bear. 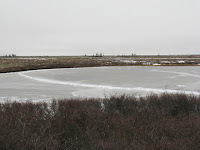 This is the time the bears come into the area, preferring the feel of firm land or hard ice under their paws versus soft marsh where they will end up with wet feet. I have a friend who has sailed all over the world. He once told me that the cruise along the Chilean fjords was the most beautiful scenery that he had ever seen so, of course, this area of the world has been close to the top of my bucket list. But only being familiar with mainstream cruise lines that sailed between Santiago and Buenos Aires, I didn’t think this would be a trip we’d ever make. Until I came across a web site of Patagonia Chile tours by ferry. Duh! Of course there would be a ferry in the region, providing transportation for the locals to get from place to place. The site is for Navimag ferries and they offer three types of Chile tours. The sailing along the fjords is a four-night adventure that starts in Puerto Montt and ends in Puerto Natales or the reverse. The web site gives full information regarding departure dates and pricing and also provides photos of the accommodations. As I would expect on a ferry, the accommodations are a bit low-key, small with bunks, and the option of cabins with shared or private baths. High season runs from November to March and low season, with a significant drop in price, runs from April to October. For anyone doing a land tour of South America, this is a great option for sailing the Chilean fjords. 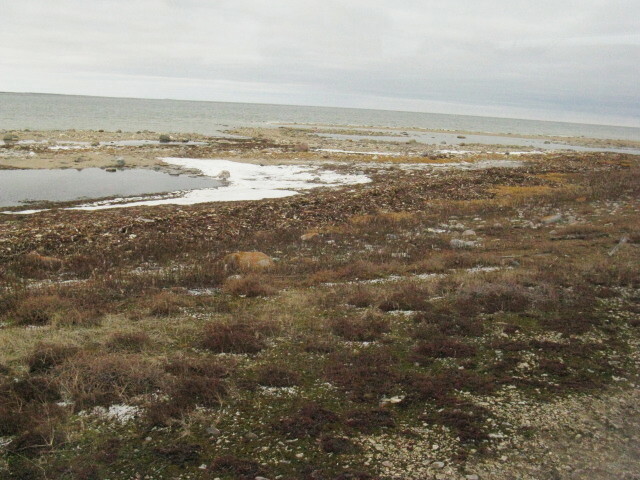 Churchill, Manitoba, Canada is located on the southwestern shore of Hudson Bay. We were fortunate with the weather. Yes, it was cloudy most of the time it was also relatively mild, with daytime temperatures in the 30’s (F) versus the teens that are more common at the beginning of November. We did have some snow flurries that iced up the walkways and plenty of wind. 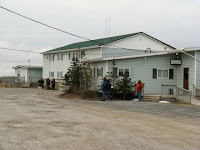 Our accommodations were at the Northern Lights Inn. Our room had two double beds, a table with a flat screen TV on it, a night table between the beds, a dresser with a mirror and a small area with hangers. There really was not a lot of room to spread out but we managed. What I loved was being able to adjust the temperature in the room, something we had been unable to do at the Hotel Fort Garry in Winnipeg. 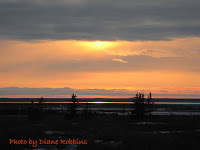 We spent three full days in Churchill, shuttled around by Lindsey who, when not driving a tourist shuttle, works at the one and only hardware store in town. 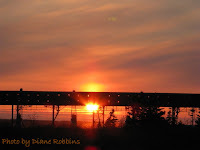 We were up at 6:00 a.m. for breakfast at 6:45, a buffet of eggs, french toast or pancakes, sausage, Canadian bacon, potatoes, cold cereals, bagels, muffins, fresh fruit salad (yes, FRESH – cantaloupe, honeydew, pineapple, watermelon, orange slices), juice and coffee, and on the shuttle by 7:30. 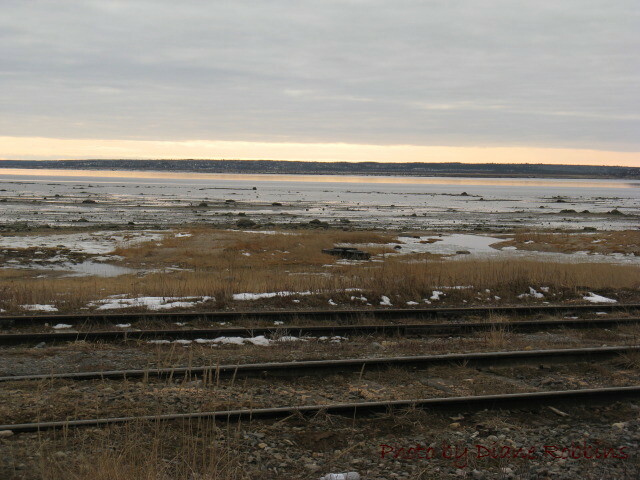 By 8:00 a.m. we were on the polar rover and on our way. We went over (and through) some incredible landscape. 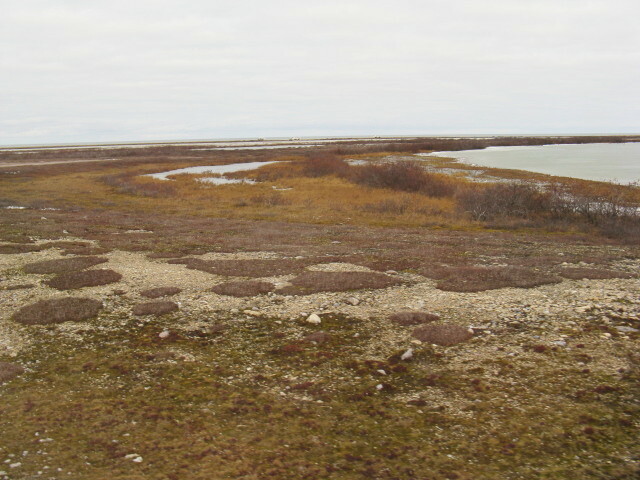 Permits are required from the Canadian parks department for travel through this area. 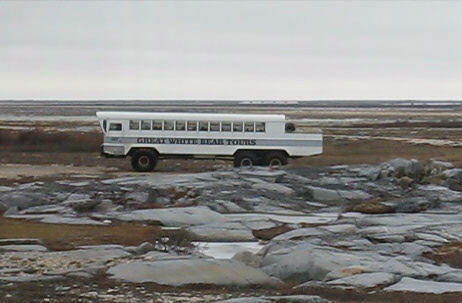 The company NatHab uses in Churchill, Great White Bear Tours, has permits that allow it to go the furthest out on the tundra than any of the other companies. We went on rocky roads, through water, up and down rutted ditches. The ride alone was an experience. Mid morning we would stop at a good spot (read that as a place to watch bears) and have coffee and snack (brownies, cookies). At lunchtime we would stop at another ‘good spot’ and have a hot veggie soup, a choice of three sandwiches (one veggie, one usually chicken and one usually beef), a pasta or potato salad and dessert. Beverages were always available. Dinner was a selection of soup or salad (again, nice fresh greens and other veggies), a choice of about 5 entrees offering fish, vegetarian, chicken, beef or pork served with vegetables, desert (every desert except one was carrot cake LOL) and beverages. We sat down to eat anywhere from 6:15 to 7:30 p.m. depending upon what was scheduled. We had one evening program of a slide show and another evening program visiting with an Inuit woman in her teepee. That was quite neat. 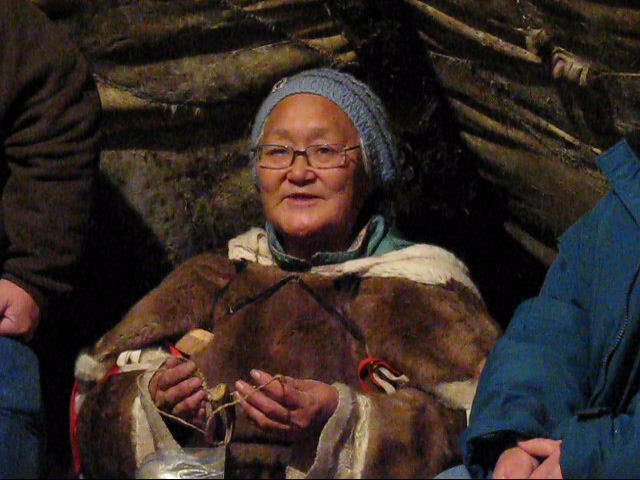 The Inuit are the ‘people of the caribou’ and it was fascinating listening to how they made use of the entire animal, from thread to snow goggles. Other evenings we had a bit of time to walk around town. We didn’t run into any bears, fortunately but we did spook a blue fox. 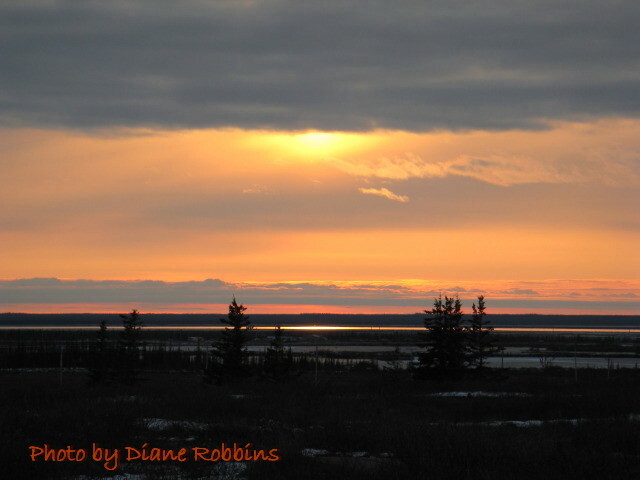 On another night we were able to photo a great sunset and then, after returning to our rooms, were alerted at about 9 p.m. that the Northern Lights were visible. That night we were back at our room by 10:30 p.m. or so, as 10:00 p.m. is when the curfew siren goes off, part of the bear patrol routine during bear season. Do you shop at Amazon.com ? If you do your holiday shopping through Amazon.com (or actually any shopping at all through Amazon.com ), I would appreciate it if you would click on the link in this post first and shop through my Amazon Associate site. There is no additional cost to use and, yes, I get a small percentage of your purchase. While I typically research a destination to death before we leave home, there are times I want to leave the planning to someone else. In my current ITN newsletter, there is a brief article on Viator. Viator offers almost 9,000 guided day trips throughout Europe, South America and the Caribbean. Travelers can search for excursions using several criteria including location, city, dates, activity type and more. Results can then be sorted by price, ratings and best sellers. Information provided for each tour includes itinerary, price, time, exclusions and inclusions. A complete itinerary for a location can be built and booked at the website. I haven't used the site yet myself but it certainly looks like it has potential. Just for the heck of it I clicked on a few cities I've already visited to see what might be offered. For instance, we've already been to Venice but I've been looking at another cruise that begins there. Since we like to arrive a day early when we tour, I wondered what options there might be for a day in Venice. On Viator I found a day trip to the Dolomite Mountains or the Veneto Hills. If nothing else, looks like this site could be a great destination resource. 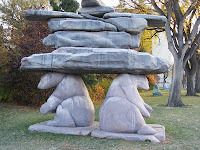 Starting with our visit to the grounds of the Parliament building, to the Manitoba Museum and throughout our visit in Churchill we were exposed to the inukshuk. An inukshuk can have several meanings. It is used as a guidepost, pointing which direction to travel. It has been used to mark places of historic and ceremonial importance. 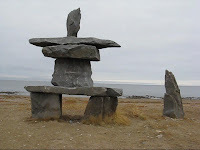 The Inuits also used inuksuit (plural form) to help them hunt caribou, building inuksuit in a V-shaped configuration and driving a herd into the open end, forcing them together as they came out the end of the V.
A few weeks before we took our Antarctica trip, we read of the sinking of the MS Explorer and the rescue of her passengers by the Nordnorge, the ship we would be sailing on. 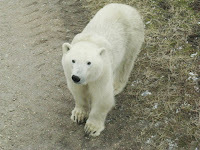 On our polar bear trip we met an Australian from Brisbane named Scott. Not only was Scott on the ill-fated Explorer, but he was actually the passenger who sounded the alarm. 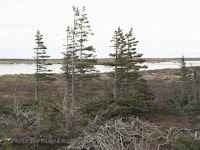 He was awakened by the sound of running water and, thinking the faucet in the bathroom had been left running, he swung his feet out of bed only to land in ankle deep ice cold water. Leaving his cabin he found some crew members in a lounge and alerted them to the water. They returned with him to his cabin and radioed the Captain. One of the crew member dipped a finger into the water and put it to his tongue. Apparently the Captain asked the crew member to taste the water to find out if it was fresh or salty. Salty! The Captain then came to the cabin and did the same thing, followed by an expletive. The abandon ship order was soon given. Passengers congregated in the lounge, some bringing suitcases and tote bags. The crew grabbed the bags and tossed them into the middle of the lounge, making it clear that the life boats were for passengers only. 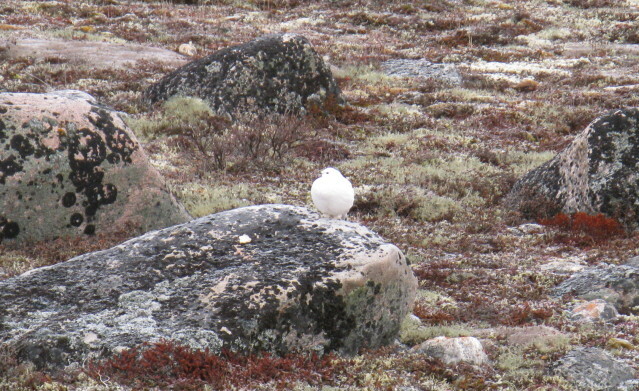 After about 3 hours bobbing around the Arctic Ocean, Scott climbed aboard the Nordnorge. 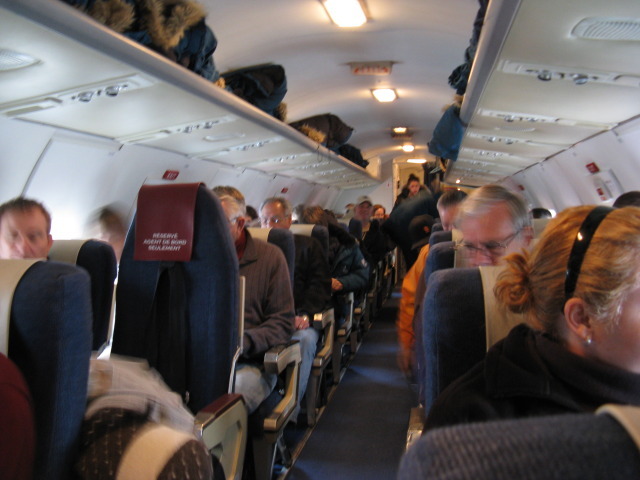 It took about 5 hours for all passengers to be brought safely aboard. Fortunately the MS Explorer purser had collected all of the passports and had the presence of mind to grab them before climbing into a lifeboat, making the trip home for the Explorer’s passengers just a bit easier. In my opinion, the best thing we did when packing for this trip was to plan on layering. With everyone dressing for the outdoor wind and cold, I could not understand why the buildings were kept so warm. I peeled every time we entered a gift shop or sat down in a restaurant. Plus it got hot in the polar rover if the windows were closed for any length of time. 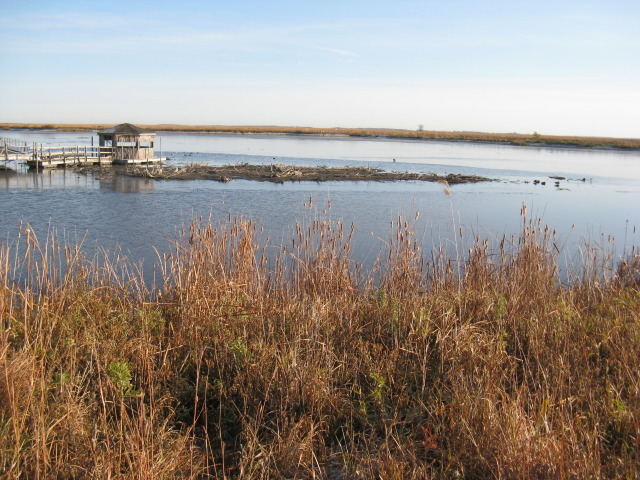 The weather when we visited, at the end of October/beginning of November, was unusually warm. 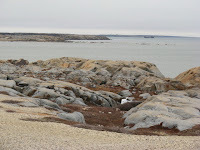 (We were told that the pack ice was forming two weeks later than normal.) Daytime temps were in the 30’s and we had only a dusting of snow. We never wore the boots provided by NatHab but certainly would have if there had been a few inches of snow or it had been significantly colder. As it was, we wore our hiking shoes with sock liners and wool socks. During the day, we layered with items like long underwear, quick dry t-shirt, long sleeved shirt, fleece jacket and/or fleece vest. We topped it off with our waterproof/windproof shell that we had received from Hurtigruten on our Antarctica trip. We added gloves/mittens with glove liners, hats and I added a scarf. Jerry added windproof pants since he planned on spending time photographing from the rover’s open deck. Night was different. It was COLD. At night we wore the NatHab parka instead of our waterproof/windproof shell. We still had our layers underneath so we could shed based upon the inside temperature. Finally, if soap in a bar and shampoo in a bottle is important to you, pack them. The Northern Lights (photo), the hotel we stayed at in Churchill (and I’m guessing the few other hotels also) had dispensers at both the sink and in the shower containing a blue gel that came out as a foam. It worked fine for us but I can see where some people would prefer a bar of soap and liquid shampoo. 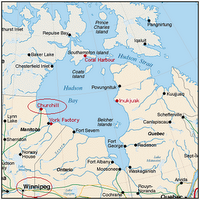 Located on the southwest shore of Hudson Bay, Churchill has a long history in the trading and shipping industry. 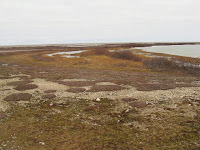 Previously it had also been a rocket testing area for the Canadian and U.S. military. 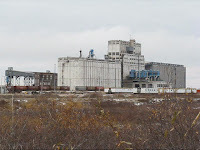 Today its harbor, which is open for about four months of the year, is a major grain shipping port. 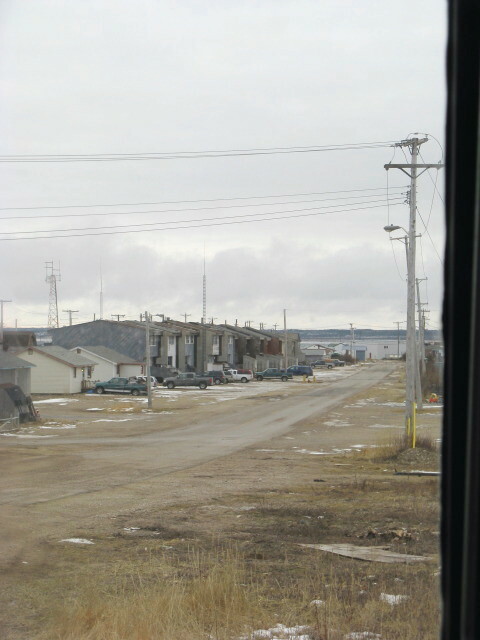 Churchill is very small, with one main street that has 15 street lamps. 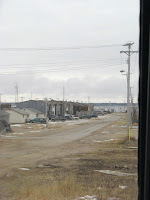 This picture is of one of the side streets which are mostly residential. The town has a large town center that holds the library, town offices, a theater, pool, hospital and essentially provides a place for the local residents to congregate during the winter. There is one supermarket and one hardware store. Everything must come in by boat, rail or air. 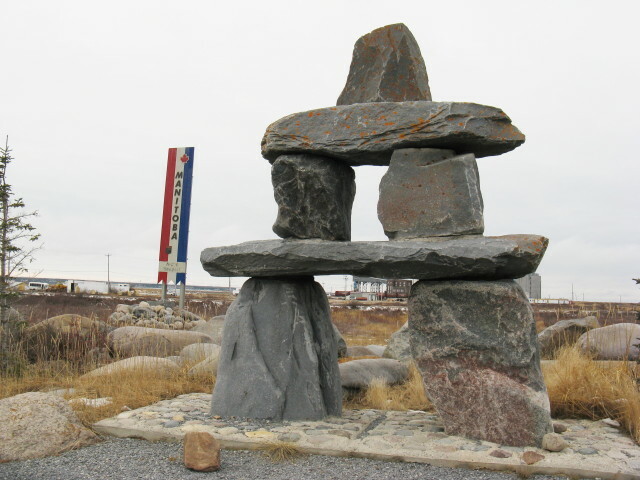 Today industry in Churchill means tourism with the town promoting the northern lights during the winter, birds during the spring migration, beluga whales and brown bears in the summer and polar bears in the fall. Accommodations are basic with about five hotels, similar number of restaurants, an Eskimo museum, about eight gift shops and a post office that has a “Polar Bear Capital of the World” cancellation stamp. 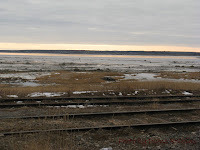 I have been in some out-of-the-way places but Churchill seemed the most desolate to me. 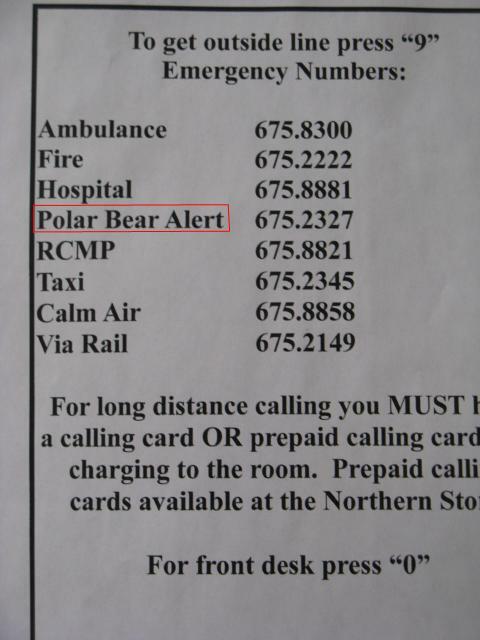 I don't know if it was the cold or clouds or the short days but I also have to admit this is the first time I stayed in accommodations where one of the emergency telephone numbers was for Polar Bear Alert. 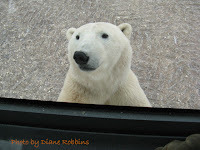 Our trip to the Manitoba Museum was part of our Extra Day package that we elected to take on our National Habitat Adventures trip to see the polar bears in the wild in Churchill, Manitoba, Canada. If you go to Winnipeg and do not spend a few hours at the Manitoba Museum you will be missing one of the best things Winnipeg has to offer. 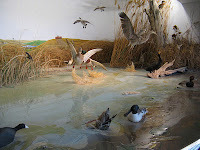 This museum is excellent with beautiful dioramas, well-labeled displays and great organization. We had a two hour guided tour and it was very informative and thoroughly enjoyable. If we were on our own, I could see us spending much more than two hours. It is well worth a visit. Just be sure to allow yourself a few hours to make the most of your visit. Our polar bear photo trip with Natural Habitat Adventures included a pre and post night stay at the historic Hotel Fort Garry in Winnipeg, Manitoba, Canada. This is an upscale hotel, old and beautiful. 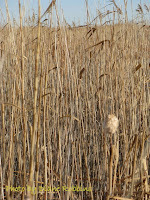 It is within easy walking distance of The Forks, the VIA train station and the parliament building. Our package included a daily breakfast that was top notch with custom made omelets, eggs, waffles, etc. Yet I have some not too positive comments as did several members of our group. Apparently the hotel offers beds with either a tempurpedic mattress with down duvet and pillows or complete feather bed ensemble including feather beds. We were assigned rooms without anyone asking if we had a preference and those on feather beds, including my husband, found the bed too soft. Internet access for anyone with a wi-fi device needed to pay a $15 a day fee for access. NatHab had negotiated a special fee for its guests of $3 per day. When I was told this I got the impression I needed to pay and get a log on code to use the computers in the lobby so I paid for one day, a $3 charge I soon learned I didn’t need to pay. The two laptop computers in the lobby are totally free. Interestingly enough the laptops were on a counter top and you have to stand to use them. Definitely a way to keep users from getting too comfortable and hogging the machines. Our room was nice sized with two double beds. No view to speak of but I wasn’t there to look out the window. The room has a thermostat but I couldn’t adjust it. I made two stops at the front desk to request that the room be made cooler and was told maintenance would take care of it. Right! Never happened. Lastly, while the breakfast room was lovely and service was quick and friendly, there was nothing informing guests what was available. I didn’t find out until I saw what other diners were eating that there was French toast, hash browns and sausages available. I wouldn't have even known waffles were available if I didn't see the waffle maker. They were all behind the omelet station and needed to be requested. And while there was a sign showing the ‘omelet of the day’, there was no information about what other items might be available to go into an omelet. Lastly, I have never seen such a large hotel lobby with so very little seating. As you enter the front door, to the right, there is a small seating area. That’s it. Other than seating in the bar, of course. All in all, stripping the bed down to just the top sheet and wearing only a t-shirt to bed made the room temperature OK. We definitely didn’t go hungry at breakfast with custom-made waffles and eggs. I managed to get my email checked quickly on the free laptops in the lobby. And we spent as little time as possible hanging around the no-seats-available lobby. 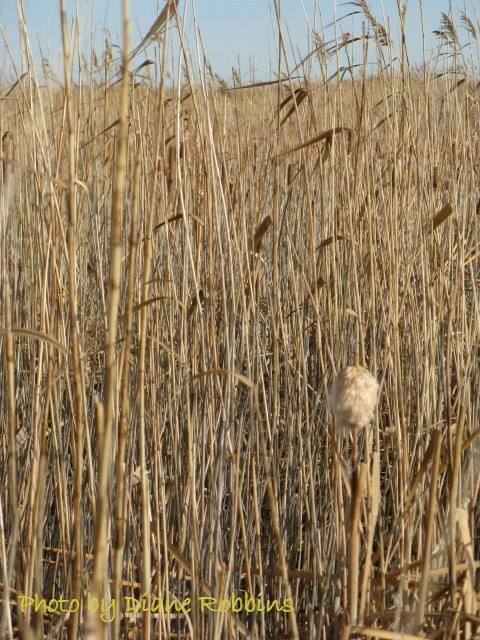 Our trip to the Canadian tundra was with Natural Habitat Adventures. 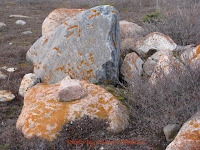 We chose them for two reasons – they came recommended and they offered a photo trip. NatHab, as it is affectionately called, offers trips over a four-week period, running from about the third week in October to the third week in November. 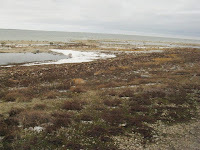 At this time of year, polar bears are gathering at the southern shore of Hudson Bay, waiting for the water to freeze so they can head out over the frozen bay to hunt for their primary food source, seals. 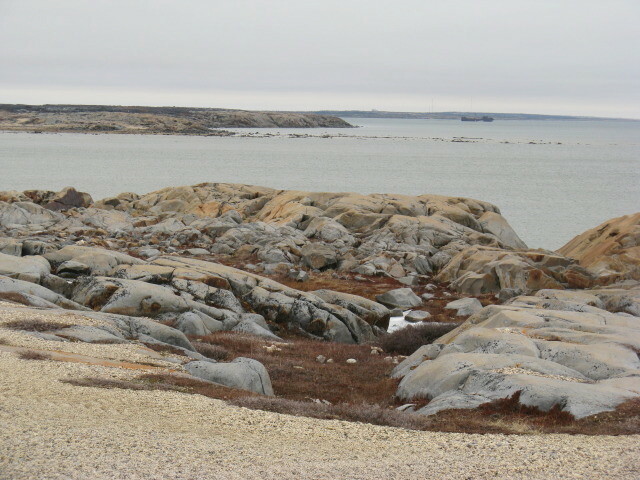 Churchill, a port along the coastline, is right in their path. 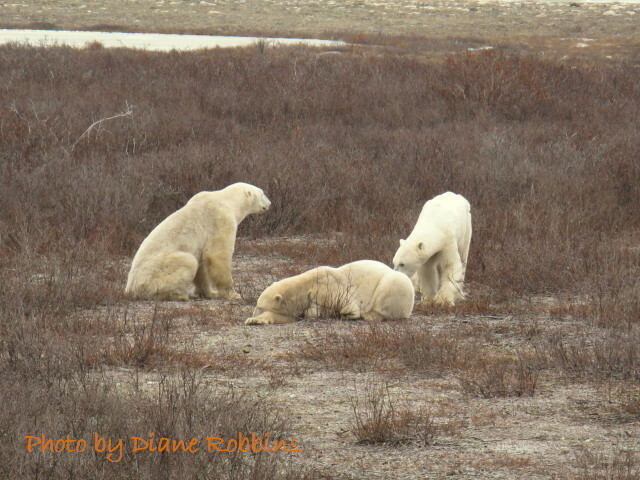 Hundreds of bears pass by Churchill on their journey along the coastline and our job was to get out onto the tundra to photograph them. NatHab runs a first class operation. My travel agent, Ellen, who worked with their back office, said that they were a pleasure to work with – extremely professional. The pre-trip literature was excellent, including a spiral bound book about the trip, Arctic wildlife, history and the Inuits. Also included, of course, was information specific to our trip. 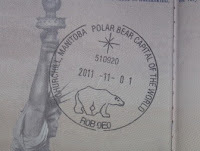 In addition to the photo trip to Churchill, we elected to take advantage of NatHab’s Extra Day in Winnipeg. Since our arrival was in October, this included a trip to the Oak Hammock Marsh and the Manitoba Museum. (More on both later.) Our meet and greet at the airport went perfectly. Our hotel room was ready. In the hotel lobby, we were met by another NatHab staff member who gave us up to date information regarding our trip and who informed us that Internet access was available to NatHab guests at a special rate of $3/day (as compared to the regular charge of $15/day). Those without a computer could use the free computers in the lobby for email check, etc. NatHab provides boots and parkas for its trip to Churchill. The company has a room on the 9th floor of the hotel where travelers could stop in at their convenience to try on and pick up the clothing. The boots are waterproof and have warm linings. The parkas are heavy and warm, with big hoods. On this particular trip, with the weather warmer than typical, we did not need the boots but we used the parkas when we went out in the evening. 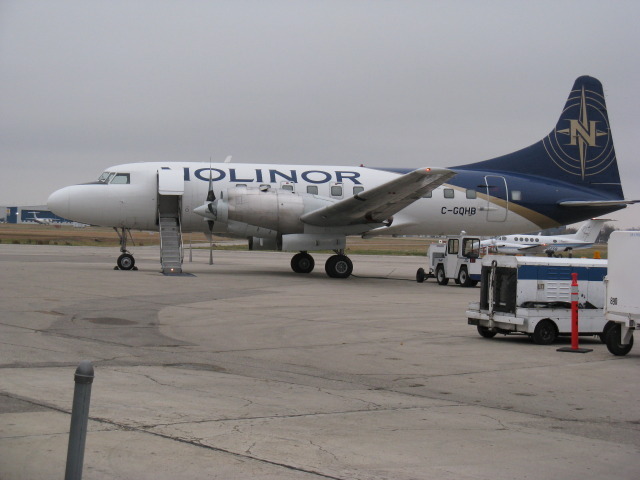 Flights to and from Churchill were on a charter, meaning we didn’t have to worry about going through security. It made packing liquids and gels a lot easier. The overhead bins were open so only soft items like jackets could go there. If it wouldn’t fit under the seat in front of us, it had to be either checked or tagged ‘Valet’ to go inside the plane. Camera bags had a ‘Valet’ and ‘Fragile’ tag. No worries. The NatHab and airline personnel all have a lot of experience handling fragile and expensive camera equipment. All of our meals were included except for dinner on the Extra Day and dinner on the last day when we returned from Churchill. I had done some pre-trip research and for our first night we ate at Ivory, an Indian restaurant within easy walking distance of the hotel. We elected to go with the buffet and had an excellent dinner ($19.95 per person). The last night was a going away cocktail party. There was a table with rolls and bread, deli cuts, olives and pickles, and fresh fruit. It was more than enough to make a small sandwich or two and did just fine for us for our last dinner in Winnipeg. I’ll be writing more posts about specific parts of the trip but, in general, NatHab delivered. I would not hesitate to recommend them or to take another trip with them.